Costs – Discover the local costs of removal, maintenance and stump removal for trees in the Baton Rouge, Louisiana area. FAQs – What trees appeal to you as a Baton Rouge resident? Do you know some might have a harder time in the climate? Learn more. Services – Call a pro today and start planting new trees or maintaining your current trees so they flourish for many seasons to come. How Much Do Tree Services Cost in Baton Rouge? Trees offer plenty of shade during hot and humid summers in Baton Rouge, Louisiana. Unfortunately, trees can also impede enjoyment of the yard and are dangerous hazards when old and overgrown. Homeowners may find the costs of hiring a professional to remove trees are quite affordable. Tree removal is a last ditch option when a tree is simply too old or rotted away. Homeowners may even have a felled tree in the yard that needs removing by professionals. The costs for removing a felled tree are less expensive compared to the costs of removing a live tree. At a minimum, the cost to trim or remove the tree in Baton Rouge is $390. The high-end for tree removal is about $2000. After removing the tree, homeowners still have to contend with the tree stump. Removing a tree stump requires specialized equipment, which is where most of the cost comes in. However, the low end is $76 for a medium tree stump, and the high end is $133 for a large tree stump, making this service much less costly. Regular maintenance, such as trimming and pruning of trees and shrubs, is essential to prevent further problems. Homeowners can save themselves some effort by hiring a professional service to do these jobs on a regular basis. The minimum cost to trim a tree in Baton Rouge is $100. The maximum cost to trim a large tree or multiple trees in Baton Rouge is $1000. Boasting access to the Gulf of Mexico and the mouth of the Mississippi River, Baton Rouge is an interesting and diverse place to live. The warm, humid environment allows many kinds of marshland trees and shrubs to grow. A permit is required to cut down trees on private or public property in the City of Baton Rouge, when completed on an area greater than one acre. Homeowners with larger properties are responsible for getting this permit. Otherwise, there is no need to worry. 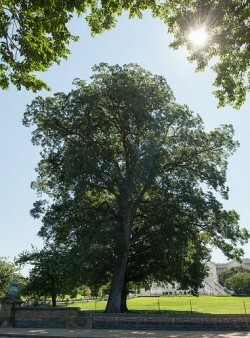 Some types of trees are protected by state law. The cypress tree, also the state tree, is protected on state-owned water bottoms. It is also protected on any land, including private property, within 5 feet of sea level and on fast lands. The best time of year to consider tree trimming or removal is late winter, after the leaves have fallen, or early spring. 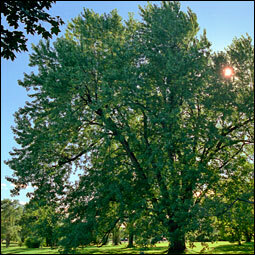 Trees should be planted 21.5 feet from the center of a utility right of way. Try to keep tree branches trimmed back at least 10 feet from power lines. Otherwise, local electrical companies will perform trimming and removal then charge the homeowner for it. The mild winters and long growing season in Baton Rouge make it an ideal place to grow some fruit and nut trees. Fig trees are one of the most popular fruiting plants to grow in Louisiana. Other excellent fruits for the area include citrus, blueberry, pawpaw, persimmon and blackberry. Nut trees suitable for the climate are pecan, walnut and hazelnut. In 1963, Louisiana designated the bald cypress as the state tree. This unusual and magnificent conifer enjoys swampy areas and can reach heights of up to 130 feet. However, about 80 feet is the more commonly seen height. Cypress trees have a knobby appearance where their roots spread out in marshy areas to support the large tree. 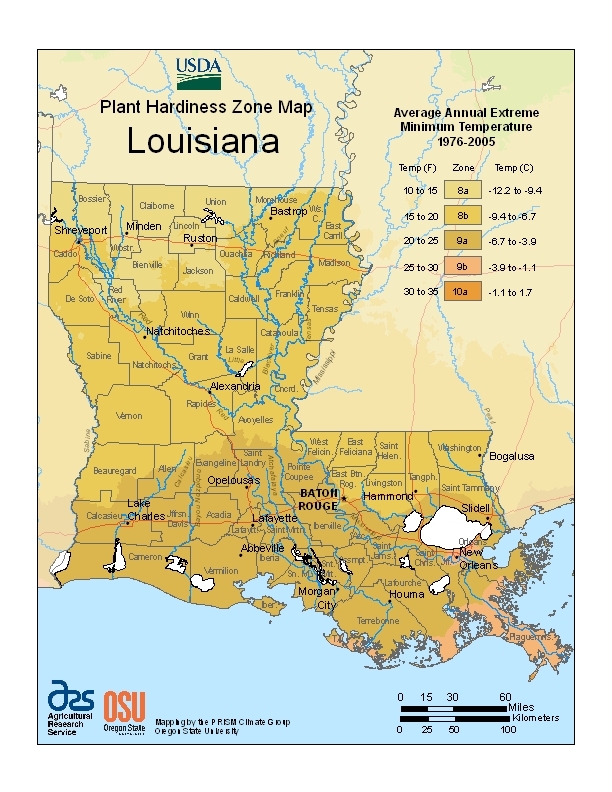 A number of new ornamental plant and tree diseases are making an appearance in Louisiana. These problems brought in by ornamentals can infect some native trees. The humid environment means that trees are prone to fungal infections and root rot. Look out for armillaria on the roots of oaks and fruiting trees. Powdery mildew hits crape myrtles in late spring and early summer. A highly contagious disease to watch out for is citrus canker, which causes legions on leaves and causes fruit to drop early.